Baseball By George ---- Did George Tell You This? Baseball By George Will who is one of Baseballs most better known Columnist in the World of print media is always on the scene of the Washington Post. George has held sway about the game since little bubba was in knee britches waiting patiently out in the tall weeds mumbling his pitiful plea "its my turn." How do we know it is Baseball season? It is Baseball By George. Baseball By George has the answers but he wants the answers to match the doing. We know full well you are one of our " baseball loyal fans but Will George know it? 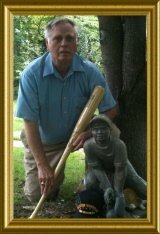 Review and ponder these Baseball By George questions try your dead level best as a true baseball fan to answer without the peek to verify your guess. 13. Only once in a 22-year career -- in his last season, when he was 42 -- struck out three times in a game. 19. Has the highest single season batting average since 1901. 21. Has 283 wins (more than 40 Hall of Fame pitchers) and 16 Gold Gloves but is not in Cooperstown. 32. Pitched three Giants wins over the Athletics in the (BEG ITAL)five-game(END ITAL) 1905 Series. 41. Before David Freese did it in Game 6 of last year's World Series, were the only two players to hit an extra-inning walk-off home run when facing elimination. 42. Was hitting .394 when the players' strike ended the 1994 season on Aug. 12. 43. Said, "It beats rooming with Joe Page." (34) Willie McCovey, 18. (35) Jesse Orosco. (36) "Shoeless" Joe Jackson. (37) Todd Helton. (38) Don Newcombe and Justin Verlander. (39) Tom Seaver, 10. (40) Ruth. (41) Carlton Fisk, 1975, Red Sox, and Kirby Puckett, 1991, Twins. (42) Tony Gwynn. (43) Joe DiMaggio, about being married to Marilyn Monroe. Baseball By George sure has its way of taunting one to know and to love the game.